The best choices can emerge from the worst of situations. Heenal Rajani, a 34-year-old man from the UK, found this out to his advantage. An accident that nearly killed him made him change his perspective towards life and what was really important. It was this that made him leave the UK and join Hug It Forward, an American non-profit organisation, in its mission to equip remote villages in Guatemala with schoolrooms. These schoolrooms are what constitute bottle schools. Bottle schools began with a Peace Corps volunteer called Jonathan Miller, who in turn derived his plan in 2008 from the NGO Pura Vida in Guatemala. Pura Vida was started by Susanne Heisse, and the NGO has used the eco-bricks made from plastic bottles to construct walls, homes, benches and so on. Jonathan built a school with eco-bricks for the community he was working in and other Peace Corps volunteers were inspired by this to do the same in the communities they were charged with. Hug It Forward began its initiative in 2009 and till date they have completed 73 schools, including some in El Salvador. 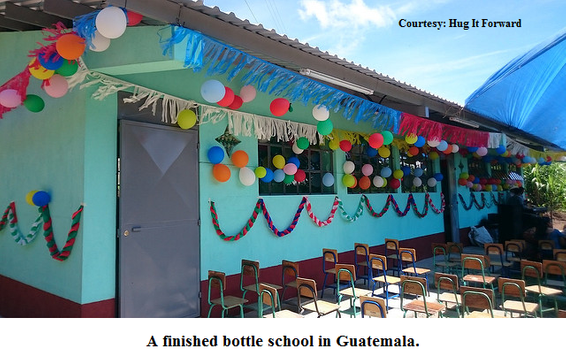 The wonderful thing about these bottle schools is that they not only provide an environmentally sound solution to the profound garbage problem in Guatemala, but they have also become a bonding factor as a complementary effect. The goal is to collect garbage, in this case a myriad plastic bottles that speckle the landscape. How do these bottles come to be here, in remote mountain villages? A damaging result of Western capitalism is the idea that consumption of any product that is a symbol of Western affluence transfers that sense of importance to the consumer. These bottles are converted into eco-bricks by stuffing them with plastic bags, wrappers and other plastic waste. Before this the bottles and plastic waste for stuffing are washed and dried in the sun to make sure no organic matter remains. This is to avoid any chemical reactions this may cause in the due course of time. Then the bottles, which are usually 500 ml bottles, are stuffed with plastic waste using a stick to press them down till every gap is filled. One 500 ml bottle can take around 100 plastic bags. 500 ml bottles are considered the most convenient though bigger bottles may be used as well. The bottles go through a process of inspection to make sure they meet required standards. If they do not, they are sent back. The bottles are then bound between layers of chicken wire. Two people are needed to do the binding and one person holds the bottles in place and the other binds them. Then layers (usually three) of concrete are applied to the chicken wire and the bottles, thus creating walls of the classrooms without the traditional materials of mud bricks or cement blocks. Other materials like wood are employed in the construction too, and gradually the end product is a beautiful classroom. Around 6,500 bottles are needed to build a two-classroom school. The cost is much lower than normal schools because of volunteer and community labour, and the use of eco-bricks. It takes an estimated 6,500 US dollars to construct one classroom. Although all Hug It Forward schools use cement, it is not necessary that cement be used. In its place wood, bamboo and other material that is conducive to the immediate surroundings could possibly be adapted to the building plan. The schools are ideal for the disaster prone Guatemala, which is constantly plagued by earthquakes. 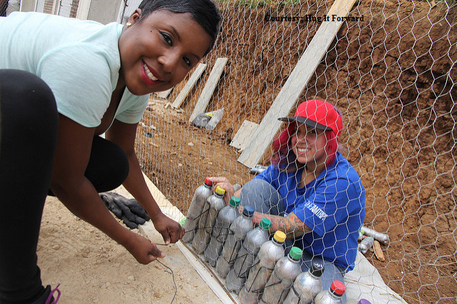 There have been situations where a bottle school is the sole surviving structure in the aftermath of an earthquake experienced by a bottle school community. The plastic bottles within the walls are not affected by heat or other climatic features. In fact, the temperature within the classrooms remains stable throughout changes in weather. The school children experience a sense of achievement and responsibility by taking part in the process firsthand. They are given a course in environmental education before the building begins, where they are taught about a whole range of environmental problems such as deforestation, mining, water quality, etc. They obtain a hands on experience of what it takes to protect the environment and how their behaviour can affect them in the long run. It is a community effort on the whole and has resulted in diminished amounts of plastic waste generated. Apart from the ecological point of view, bottle schools have managed to soothe suspicious attitudes that prevail in Guatemala after years of political unrest and a genocidal war against the native Mayans during the 1980s. Hug It Forward and its volunteers keep contact with the schools and communities even after they have finished with their work, to stay abreast with the progress made. Bottle schools work well on so many levels but it depends largely on the response of the community that the volunteers wish to work in. The idea of eco-bricks and their application in the construction of walls and other structures could well provide a solution to Goa’s ever-growing garbage problem. Not only does it negate the issue of segregation at the source, which is a major problem with recycling in Goa; it removes the cost of recycling (including transportation, preparation of the bottles for further use, etc) by upcycling them. ‘What makes a project like this so special is that you get the children involved. I imagine if I had experienced this at age 8, age 10 or 12, how would that have shaped my outlook on the world? You have a real awakening process. Wow! This is what my daily consumption is doing to the planet, and secondly, this is what I can do by bringing my community together. It is an incredibly empowering thing to be able to do that,’ says Heenal. It may be an effort to create eco-bricks and deal with the idea of change, (and knowing the Goan mentality there will be the challenge of prestige being affected), but it is a change much needed if we want a liveable planet for ourselves and our future generations. We leave you with the words of Mahatma Gandhi for inspiration: ‘Be the change that you wish to see in the world’. This article is based on the talk Building with Bottles: How to Turn Trash into Treasure by Heenal Rajani at the Kokum Design Centre, Porvorim.